Amputation of the lower limb is one of the most feared diabetic complications. It is associated with loss of mobility and a poor quality of life. Amputations result in high economic burden for the healthcare system. The financial cost is also high for patients and their families, particularly in countries that lack a comprehensive health service and/or have a low income. Losing a leg frequently implies financial ruin for a whole family in these countries; therefore, a reduction in diabetes-related amputations is a major global priority. Marked geographical variation in amputation rates has been reported within specific regions of an individual country and between countries. A coordinated healthcare system with a multidisciplinary approach is essential if the number of amputations is to be reduced. This commentary discusses how studies on the variation in amputation rates can help to identify barriers in the access or delivery of care with the aim of reducing the burden of diabetic foot disease. In this issue of Diabetologia Holman and co-workers describe a worrisome variation in the recorded incidence of lower extremity amputations in England . Based on data reported by all National Health Service (NHS) hospitals, the authors calculated the number of minor (below-ankle) and major (above-ankle) amputations per year in adults and combined this with data from other sources to estimate the amputation rate per 1,000 person-years in both diabetic and non-diabetic subjects. The incidence of total amputations (minor plus major) varied eightfold across Primary Care Trusts in both patients with diabetes (range, 0.64–5.25 per 1,000 person-years) and patients without diabetes (0.03–0.24 per 1,000 person-years). These important data are in line with several other studies that reported marked differences in amputation rate within specific regions of a country and between countries [2, 3]. Amputations are usually preceded by a foot ulcer and the most important factors predicting a poor outcome of these ulcers are the extent of tissue loss, infection, peripheral arterial disease (PAD) and co-morbidity [2, 3, 4]. The reasons for a major amputation are limited; the most frequent reasons are critical limb ischaemia with rest pain or progressive infection in a leg that cannot be successfully revascularised . Sometimes an immediate amputation is performed because of life-threatening infection or infection with massive tissue loss. In addition, a minor amputation is frequently performed for a forefoot abscess, osteomyelitis or gangrene of a toe . If other options are exhausted or undesirable, amputation can therefore be a treatment and not a failure. As reviewed in 2004 in this journal, there are many factors that determine the amputation rate and pinpointing why it varies so markedly in England and elsewhere is a challenge  (Fig. 1). Part of the variability reported in the paper by Holman et al  could be explained by ethnic differences  but, owing to the study design, there is no information on disease severity or management. 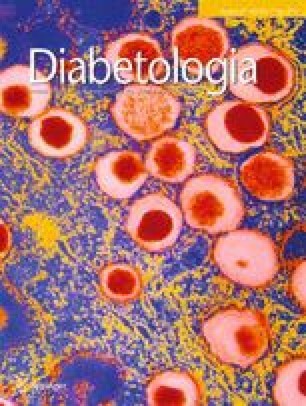 In the prospective European Study Group on Diabetes and the Lower Extremity (Eurodiale) study, which was performed in 1,232 diabetic patients with a new foot ulcer from all over Europe, the number of major amputations was too low (5%) to analyse, but the minor amputation rate varied markedly between the participating centres, from 2% to 33% . As all patients underwent a comprehensive evaluation, a disease severity score could be calculated for each patient and a large part of the variation could be explained by differences in disease severity (r = 0.75). Amputation rate should therefore not be used as a quality indicator in diabetic foot disease, unless it can be corrected for the relevant characteristics of the patient, the leg and the foot. The management of a diabetic foot ulcer requires a multidisciplinary approach, including revascularisation and surgical procedures as well as treatment of infection, oedema, pain, metabolic disturbances, malnutrition, co-morbidities, meticulous wound care and biomechanical offloading . A coordinated system of support for both patients and carers is necessary to successfully implement these strategies, and if such an integrated approach is used, 45–85% of all amputations can be avoided [8, 9, 10]. The creation of a national network of specialised diabetic foot teams that are accessible to every patient should be the first priority for the prevention of amputations. England is a country with a single nationalised healthcare system, therefore the wide geographical variation in amputation rate cannot be explained by differences in reimbursement, availability of resources or access to care but point to differences in the organisation or delivery of care, as suggested by Holman et al . Treatment delay because of underestimation of disease severity, unawareness of the potential dangers of a foot ulcer, or not recognising that it is a sign of multi-organ disease, by both the patient and the doctor can lead to a poor outcome. Initial treatment by physicians is frequently empirical, involving dressings and antibiotics. Only when the ulcer does not heal or deteriorates are patients referred for systematic management . Up to 50% of the patients with a diabetic foot ulcer have PAD and infected ischaemic ulcers in particular have a poor prognosis; spreading of infection can be extremely rapid and ‘time is tissue’ in these ulcers . In one study, late referral was associated with larger ulcers that had a poorer prognosis . In Sweden, the amputation rate was lower in a region where direct referral by district nurses to a specialised centre was possible compared with a region where patients could only be referred by the GP . Moreover, in another study a structured foot care programme with early detection of ulcers for patients at a high-risk of foot ulcers resulted in a reduction in amputations . A nationwide system for the early detection and subsequent referral to a specialised diabetic foot team should therefore be implemented to reduce the amputation rate. Such a specialised multidisciplinary foot team should preferably include a diabetologist, vascular surgeon, endovascular specialist, podiatrist, shoe technician and specialised nurse. Clear guidelines have been formulated as regards the identification of at-risk patients, diagnosis of a foot ulcer, classification of disease severity and management . Several elements of these guidelines have subsequently been validated in prospective studies [13, 14, 15, 16]. Interestingly, Holman et al  observed that amputation rates in adults with diabetes were correlated with amputation rates in adults without diabetes (r = 0.433), pointing to a common factor. Differences in PAD management might explain part of the observed geographical variation in both diabetic and non-diabetic patients. In an earlier study in England, there was marked variation between vascular surgeons in terms of the procedure chosen when given the choice of amputation or revascularisation in a series of clinical cases . A recent systematic review reported that in diabetic patients with critical limb ischaemia who were not revascularised, the 1 year amputation rate was 57% compared with a rate of 15–20% in patients who were revascularised . Moreover, new techniques and technologies have been introduced for treating PAD; in particular, endovascular approaches in the lower limb have produced promising results. If and to what extent differences in PAD management contribute to the geographical variation in amputation rate remains to be determined in future studies. However, each diabetic patient with a (neuro-)ischaemic foot ulcer should be treated by a multidisciplinary team that provides the most appropriate and up-to-date therapy, i.e. an open (surgical) and/or an endovascular revascularisation procedure. Although amputation seems a clearly defined endpoint, there are several caveats in the study by Holman et al ; besides those discussed above, there are also methodological issues. In reporting amputation rate the following should be defined in future studies: which amputation in a sequence is used as the outcome measure (i.e. the first amputation, the number of amputations or the final amputation level), are the individuals or are the number of limbs undergoing amputation reported and are the results based on the number of hospitalisations. When calculations are based on hospital admissions, a hospital can be penalised for good clinical care. For example, an immediate minor amputation can be indicated in infected neuro-ischaemic ulcers, followed by a revascularisation procedure once infection is under control. Subsequently, the patient is treated at home as restoration of skin microcirculation can take weeks, and is then re-admitted for a final operation, which can include a second minor amputation, to produce a foot that remains functional. In the Holman et al study, two amputations as part of a planned revascularisation could be interpreted as a worse outcome than a single major amputation. Moreover, in most studies, amputations are lumped together. However, a single toe, a whole forefoot or an above-knee amputation all have a different impact on quality of life and, in future studies, amputation levels should be reported. Finally, Holman et al do not describe the indication, the immediate cause of amputation or disease severity; these key data should be included in future studies for interpretation of the data. Documentation of the geographical variation in amputation rate within a healthcare system can help to identify barriers to the access and/or delivery of care that need to be removed to reduce the incidence of diabetes-related amputations. But, as discussed above, the amputation rate is not a good marker of the quality of care, and studies similar to that reported in the Holman et al paper should be used as a starting point in a process to improve the outcome of diabetic foot ulcers. There are four major decision points in the prevention of an amputation in a patient with a foot ulcer: early referral to a multidisciplinary team, aggressive (surgical and medical) management of infection, diagnosis of PAD with the appropriate tests and revascularisation in the case of impaired tissue perfusion. As shown in the Eurodiale study, even in centres with a specific interest in the diabetic foot, the standard of care was suboptimal for many patients, resulting from a lack of clear referral guidelines, financial barriers caused by inadequate reimbursement, a lack of availability of staff and the personal beliefs of the doctors . Treating these ulcers is a challenge for patients, care givers and healthcare systems. Treatment should not be focused solely on ulcer healing; diabetic foot disease is a lifelong condition, which means that the patient is always at risk of a new ulcer, amputation or early death, and so a holistic approach is needed to management as well as prevention.